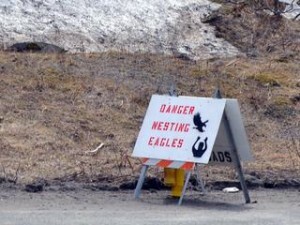 Like clockwork, the ominous signs show up every May: “Danger Nesting Eagles.” They’re placed near Unalaska’s clinic and post offices, and they feature a silhouette of a bird extending its talons toward a terrified human being. The city’s Department of Public Safety put them up last Wednesday, after getting the first report of a bald eagle attack this year. According to Deputy Chief Mike Holman, the incident took place outside the Iliuliuk Family and Health Services clinic. Holman says that while bald eagles have wounded people in the past, this attack wasn’t anything serious – just a swooping. “Nothing that was resulting in injuries — just some fear,” says Holman. Eagle-human relations are peaceful in Unalaska for most of the year. But once they begin mating, the birds become territorial. The fact that bald eagles are especially plentiful in Unalaska means that encounters with human beings are almost routine. When I call U.S. Fish and Wildlife Service spokesperson Bruce Woods to learn more about eagle safety, he says he’s been expecting me to get in touch. He says that there are probably more eagle attacks in Unalaska than any other place in the United States. He’s even had a run-in himself. “I think I told you when we talked about this last year that when I was out there years ago, I got swooped by one just because I was climbing on this little dirt hill to get a look at the nest,” says Woods. Woods adds that if you want to avoid getting attacked, you shouldn’t do what he did. He says to respect the eagles’ space and to observe them at a distance. If an eagle does start stalking you, you should put your hands up and make yourself as big as possible. And if it comes down to it and an eagle makes contact with you, Woods says you shouldn’t worry too much about legal penalties for swatting the national bird away. On Tuesday afternoon, clinic finance director Tom Smoll and I decide to take a look at the offending eagle from the safety of the building’s entrance. The nest is about five feet wide and set into a cliff that overlooks the clinic parking lot. Smoll says that this bird has been responsible for a number of attacks over the years. “From that nest right in front of the clinic here, I’ve heard of two or three that people have come into the clinic to get treated for various scratches and cuts,” says Smoll. The nest was recently deemed to be a danger to the public, and Fish and Wildlife granted the City of Unalaska a permit to remove it. But because mating season began before the snow started melting, the nest can’t be taken down until at least the fall. Smoll says that people will just have to remain vigilant in the meantime. And if they do get attacked, well, at least they’re in a convenient spot for that to happen. “Fifty feet away from the clinic doors, and we can patch them up and get them on their way,” says Smoll. The clinic’s staff will be standing by for eagle-related visits through July, when nesting season ends.